You've been looking for the perfect cream. For years, you've been on a quest to find the perfect cream. You were looking for a product that would address your frustrations in dealing with your oily, sensitive skin. What if you could control excess shine? The first thing you looked for was a product that would control excess shine. No matter where you went, you felt self-conscious, always wondering if you looked presentable. What if it prevented your makeup from smudging? Your main wish was to find a mattifying cream that could control shine and prevent your makeup from smudging. Because your skin was prone to pore congestion, you wondered whether this cream could purify your skin without stinging it or drying it out. What if you could do something about your enlarged pores? You also wondered whether this cream could shield and protect your skin during the day, so that you could apply your makeup without being concerned about clogged pores. What if you could shield your skin from pollution? Knowing that oily skin is genetic, you knew one of the best ways to keep your skin in balance was to boost your complexion with specific antioxidants. The antioxidants would withstand the harsh reality that no matter where you went, excess oil, pollution, and UV radiation will always be a cause for concern. What if you could protect and detox your skin day and night? Kaolin clay is a powerful detoxifying ingredient often found in a mask. However, you struggled to keep up with the “apply-wait-rinse” routine, always postponing it to another day. But what if this cream could be used day and night? Since you couldn't find it, we created it. Growing up on farmland in the country and understanding the therapeutic properties of natural ingredients, Nadia was instinctively attracted to using plant extracts. However, as a chemist, she was also mindful of creating a safe, stable, and effective product. She chose to give Mother Nature a helping hand. So she selected both naturally-derived and synthetic ingredients, focusing on the ones that were tested, backed by science, and proven for their efficacy in dealing with troubled skin. We spent countless hours formulating from the heart, using the best ingredients that were based on true science, not marketing hype. 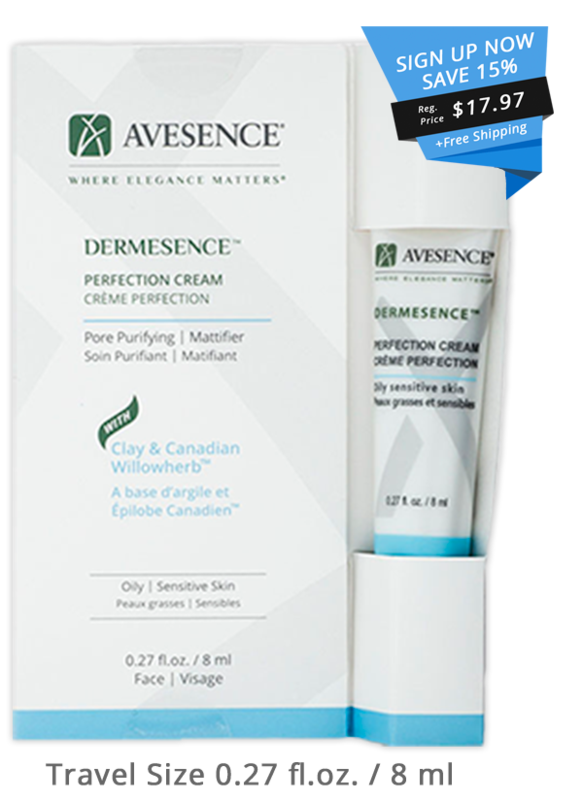 Dermesence Perfection Cream is an oil-free, invisible leave-on mask that acts as a pore purifying, brightening, mattifying primer. Although it was originally designed for oily skin, this cream can be used on all skin types and can be easily incorporated into your usual routine as a shield against pollution. It’s also easy to use. You just apply and go!